‘Tis the season for Christmas riddles brain teasers! This holiday exercise that big brain of yours and challenge friends, family and kids to see if they can solve these riddles about Christmas. The holiday season is all about being with those we care about and having a good time together. Singing carols, opening presents and eating food are all traditional Christmas past times, but a great way to add a big of jolly merriment is to share Christmas jokes and riddles with each other. This collection has been broadly divided into two sections: Christmas riddles for kids and Christmas riddles for adults. Within these two collections you’ll find everything from easy to hard, strange to funny Christmas riddles with answers. We hope you enjoy these and have a very Merry Christmas! I come with many colors, so beautiful and bright, I turn so many houses into a beautiful sight. What am I? I am a catchy carol and a tune which likes to rhyme, I contain 12 grand gifts that come around Christmas time. What am I? I get chopped, decorated and on one end you’ll see wings on top. What am I? What do you look forward to that’s filled with stuff and that looks like a giant persons sock? If a lion had a Christmas music album, what would it be called? What did the Christmas tree say to the Christmas stocking? Aren’t you sick and tired of just hanging around? Why didn’t the turkey want to eat on Christmas? Santa was having problems with his legs and was unable to walk so he went to the hospital to ask the doctor if he could recommend something for him. What did the doctor give to Santa to help him to walk? What would an apple and a Christmas tree get if they had a baby? What does the snowman eat for a snack? If the end of the year is on December 31st, then what is the end of Christmas? What kind of egg can you drink? What is red and white, red and white, and red and white again? When you go out in a blizzard and you see a vampire, what do you get? If otters keep their money in riverbanks, where does the Frosty the Snowman keep his money? What did the doctor tell the Christmas bell when he walked into the hospital? What do you get when you cross a bird with a turtle? Hungry for some food riddles? Or need to warm up with some winter riddles? How do the water globe and the snow globe feel during the Christmas season? Who is the most impolite and disrespectful of all the reindeer? Why did the little drummer boy allow the chicken to join him in his band? The snowman went to see the dermatologist because his head was itchy and dry. What does the snowman get when he itches his dandruff? Where do Santa and Mrs. Claus enjoy going for a swim? 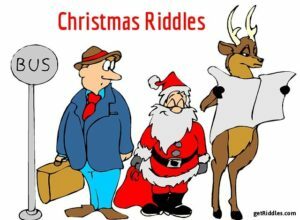 If you are looking for some hard Christmas riddles, or holiday riddles for adults, you’ll find them here. But remember the Christmas riddles for kids above aren’t only for children, they’re also for those who are kids at heart! And on Christmas, aren’t we all at least a little bit? Also, be forewarned, a few of these are a little naughty, and if you like that, you may also enjoy these dirty riddles. Enjoy these Christmas carol riddles and have a happy holidays! I am worn to mark a successful victory, I am also made of flowers and leaves formed into a circle, and I vary from big to tiny. What am I? What do you call it after all the gifts for Christmas have been opened? What phobia do people get when they see Santa Claus? Why are Mr. and Mrs. Claus childless? On Christmas how do kids know that Santa is in the room? What did the snow woman do when she was upset with the snowman? What do you call Santa when he’s broke and has no money? Why are men afraid of Christmas? What do you call an elf dancing with earmuffs on? What part of the snowman most drives the snowwoman wild? What does Warren Buffet most love about Christmas? What did the male angel say to the incredibly good-looking female angel? How do the English alphabet and Christmas alphabet differ? Get a jump start on love with some Valentine’s Day riddles! If you are related to Mr. and Mrs. Claus, what is your relation? What did Mrs. Claus get from Santa for being naughty on Christmas? Santa Claus rides in a sleigh and the 3 wise men traveled by elephant, horse and camel. What do the elves ride around in? What did the terrorist group get as a present on Christmas? Santa went to buy his sleigh but he was surprised that it was free. How did Santa get his sleigh for free? What’s the best holiday present that you can get for Christmas from Santa? What is Santa’s favorite tech gadget? ‘Tis the season for love. Enjoy these romantic and cute love riddles. Or get back to gratitude with some Thanksgiving riddles. →We hope you enjoyed these merry Christmas riddles and answers! Share them with family and friends and spread the joy of the season.